So I looked at last year’s stats and realized I did well, stat wise. And I also posted more than 600 MORE pieces than I did in any previous year. That explains a lot of why I feel so pressured. I understand there seems to be some kind of race to see who can post the most. I got a bit swept up in it. Whereas I used to post three posts a day and thought that was pretty good, the ante went up. Now I’m back down to four and working on getting back to three or even two. My day starts off late. I sleep late. Not as late as some people I know, but I’m not a dawn riser because I get to bed late, too. Unless I am not feeling well, I like hanging out in bed in the morning. This particular morning I was up early because I was thirsty. I went to the kitchen to get something cold and wet. While I was there, I sent the dogs out. They went out. They came back in. I gave them a treat which made them were happy. Since I was up anyway, I looked to see what animals were on my deck and it turned out, there was a squirrel convention in progress. All those seeds we spilled on the deck? The squirrels were cleaning up. Good squirrels! No birds yet, just squirrels. I could have tried taking pictures, but I chose to go back to bed. I know. Very lame, but I was tired. 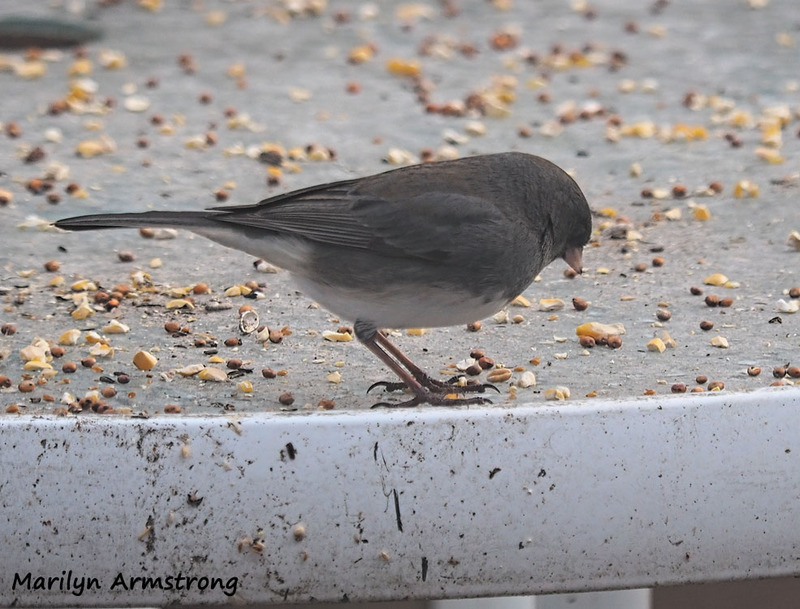 When I did get up, a few hours later, I realized we had a lot of birds on the deck. 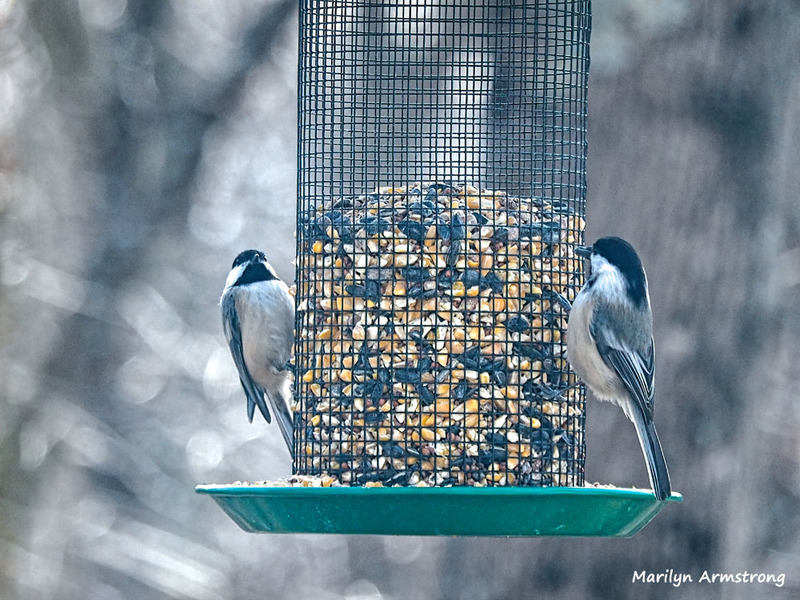 Flocks of Chickadees and the Titmouse were flying at the feeder, grabbing seeds and flying off. 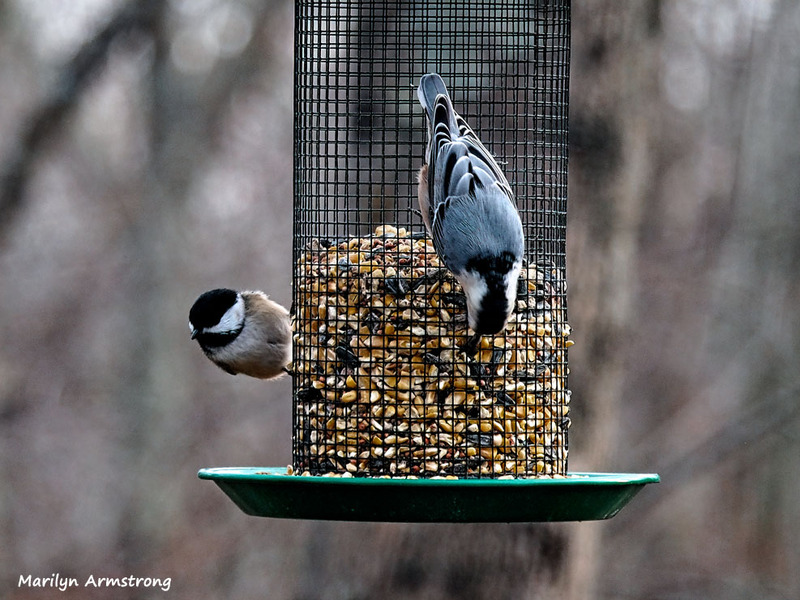 They were on the feeder, in the trees, on the table, on the deck, on the railing — and in both feeders. It was a relatively warm, sunny day and they were eating their hearts out. I took pictures. Before I got to take the SD chip to the computer, a Red-Bellied Woodpecker needed photographing. 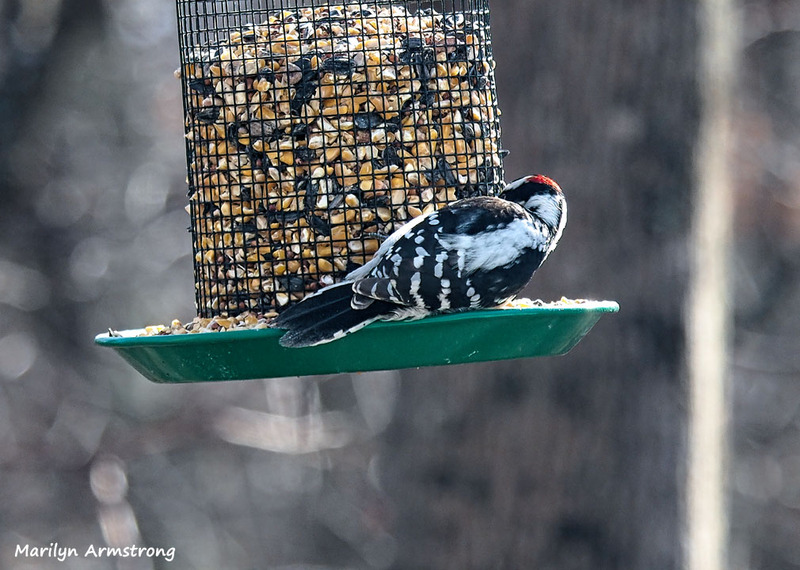 He didn’t stay long because the Chickadees were not going two days without eating because the woodpeckers took over. I took more pictures. Then I took out the chip and put a new one in … and then there were even more birds, so I took more pictures. At that point, my need for coffee overcame all other needs. I downloaded all the picture — all 140 of them. I hadn’t even left the house. I never did get around to backing up December. I guess I’ll do that tomorrow. Garry has one of his “old media guys” get-togethers tomorrow, so while he’s schmoozing, I’ll back up my computer. Unless I wind up taking more pictures. I also have to remember to give the dogs their heartworm meds. And go grocery shopping. Because I didn’t go today. Somewhere in there, I’ll write something, if I have the time. If not, the world will have to cope with a little less of me. It’s no wonder I don’t have any time to do anything but blog, run errands, and catch a few hours of sleep. There isn’t enough time to do anything else. I’m pretty sure there’s gotta be a better way. On a positive note, taking pictures of birds has saved me from an endless preoccupation with the horrors of the world. Our government, the rest of the world’s horrors, the condition of the planet, and the likelihood we’ll wind up without a planet we can live in slightly more than a decade. There’s a lot of potential obsessing in that bundle and I’m grateful to have something else to do with my brain. Tonight on television they were selling burial insurance. It was a very pushy ad. 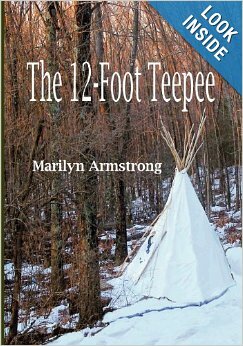 For free, you can get a copy of “Things to Take Do Before You Kick The Bucket” or something like that. It’s free! It gives you lists of stuff you need to deal with so you can be buried. Garry laughed. I laughed. We’ll deal with it when it happens. I refuse to sit and write-up lists of what to do before I die so my dying will be neat and tidy. I lived a messy life. I might as well die a messy death. The pictures of the birds are beautiful. The birds are wonderful, but the time I need to take the photographs, process them, then post them — which takes at least half a day and I think that’s conservative. So if I have anything else to do, my day is gone before it starts. I get a kick out of the burial insurance ad. Black humor? What if you want to try it before you buy it? I never considered that possibility. I could write a post on that. Hmm. Not only is life short, but it’s getting shorter. I feel like I’m missing it as it skitters by! Great advice by Beth. Post as much as convenient. That would be once (maybe twice?) a day. More than that and I’m pushing. Much more than that and I’m eliminating a personal life. Once should be okay. Most people do that. Your post made me smile, but I also sat back in awe. A post a day I think is huge, so to be doing 2, 3 and 4 I think AMAZING! Wow, how do you fit everything else in? I don’t fit it all in. That IS the problem. I really can’t keep it up and have a life outside the keyboard. I wind up deleting hundreds of emails a day because that’s what’s left when I finally give up and have to go to bed. And I don’t think most people even read all the posts. I don’t remember writing them, so how can anyone remember reading them? I never really examine my stats in detail and after 10 year in WordPress still do not really understand what I am looking at. I just blog, currently with three basic blogs a day, although sometimes one or two more. Sometimes just a photo with a few words, sometimes words with a few photos and now and again a poem (although I am not really sure if you can all it poetry), but I am here and so are you and that is the important part of it all. Maybe I need to give up getting everything as email. The problem is that I like actually reading material and not just flowing through it on The Reader. I can’t keep staying up late every night trying to catch up with email. Eventually, I give up and just delete anything left over. It’s too much incoming. Outgoing isn’t the problem. It’s the arrivals terminal! I delete the mails usually and much prefer the reader as I see at a glance who and what it is. Blogging and posting keeps you busy? I say go for it. Your followers are reading quietly in the background. I need to cut it down to the actual number of hours in my day, then deduct 30% to do other things no involving a keyboard and screen. It’s an add and subtract issue. How much time does it take me to shoot photographs, process them, write something, run errands, and maybe … read a book. Blogging has to fit into whatever time remains. As it stands now, I find myself up very late at night trying desperately to catch up to email and never getting there. By the time I’ve managed to catch up to the first half, another 150 has popped in. Yeah, sometimes you can’t get to them. Too many. I mark as read, then go on to the next current Post. Those funerals can be very costly and of course they catch people when they are most vulnerable. My sister had everything arranged before hand. She just passed away December 4th, 2018. She was cremated and the ashes are in a beautiful ceramic urn. She is presently resting on top of our kitchen cabinets until the spring when we will take her ashes and bury her next to her mother. All she asked for were a few prayers at the grave site. Wow. Posting three times a day? Some days I have, but not everyday. But I’m trying wotd Challenge. I’ll see where that takes me. People who write more than 3 times and then constantly repost irritate me. I turned off notifications for them, but unfortunately miss the good stuff. Oh well. It’s a balancing act. Garry has the same attitude I do. We’ll deal with it when we have no choice. Even with team writing, I’m amazed you manage to post multiple times a day because l I know how long it takes you to process the photos let alone write about them. I think I’m doing pretty good if I manage one post a day on the general blog. I use the Reader because I know that on some days I won’t manage to read everything so I can scroll down and see who has posted. The ones I miss reading I’ll go back to when I have extra time to spare and anyone whose posts I haven’t read for a bit I’ll have a catch-up session. I probably still don’t get them all but I try and I assume that is what other’s do too. If I had hundreds of emails instead I’m afraid I would be overwhelmed and delete the lot. It is no wonder that you have been feeling tired, sore and under pressure, as you had written way more than the previous year. Take care of yourself more this year. As for the funeral ads, I do have funeral insurance because I don’t want who ever has to bury me to stress over how to pay for it but I know that the industry does dwell on trying to make seniors feel afraid or guilty. I don’t like that. You’re right. It takes me a really LONG time to process photos and these days, I don’t have much time to read anything — blogs or books or even watch TV. Even when the TV is on, I’m still working on something. I actually write faster than I process photos. At the end of the day, I delete all the emails I haven’t gotten to. They still exist on the reader, so I can go back, should I ever have a spare hour. But like today, I had a life, too. So, I took pictures, processed them. Wrote a short piece, but then, I also had to fill the bird feeder, water the plants, give the dogs their heartworm meds, cook dinner, eat it, clean up after it, and even have a conversation with my husband! I didn’t get to anyone’s blog today. Maybe a few, early on, but there really ISN’T enough time. Just the photography eats the whole day. I’m not sure how to deal with it. Stop taking pictures? But you love taking pictures. I think it is the deadlines that are spoiling it for you even though you are the one setting them. I don’t know what the answer is but I’m sure you will find a better balance. Love, love, love your bird pictures ! The woodpecker is gorgeous. 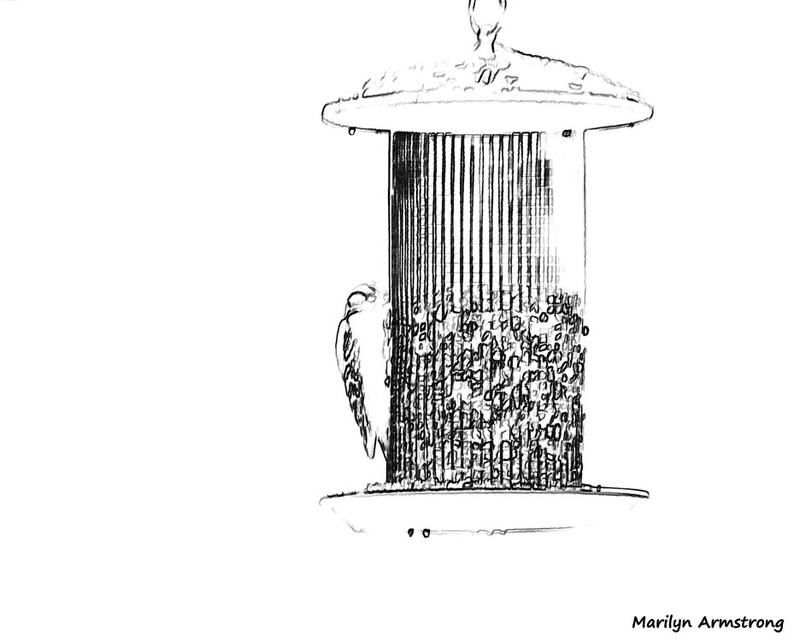 Did you know that woodpeckers hide acorns in the holes they peck in oak trees? Me, neither. Learned something new about living in California when I heard that one. But, no way should you stop taking pictures. That’s clearly one of your joys in life. 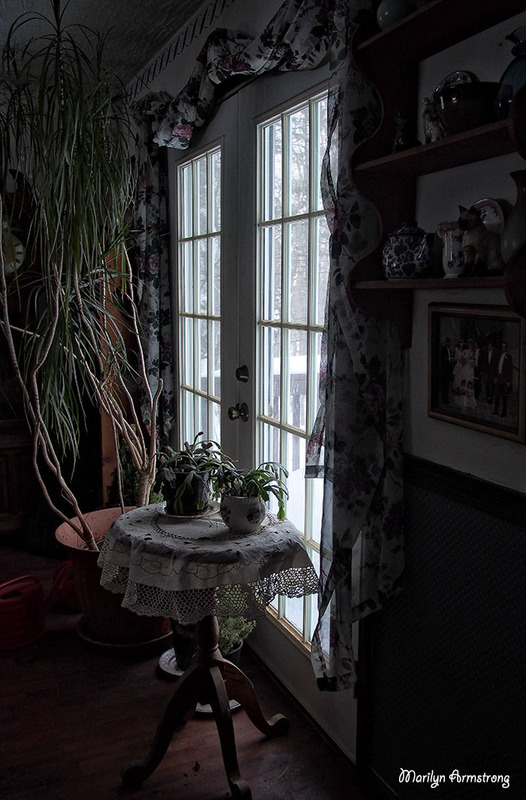 As for your first picture, the snow reflecting thru the window; thank you. 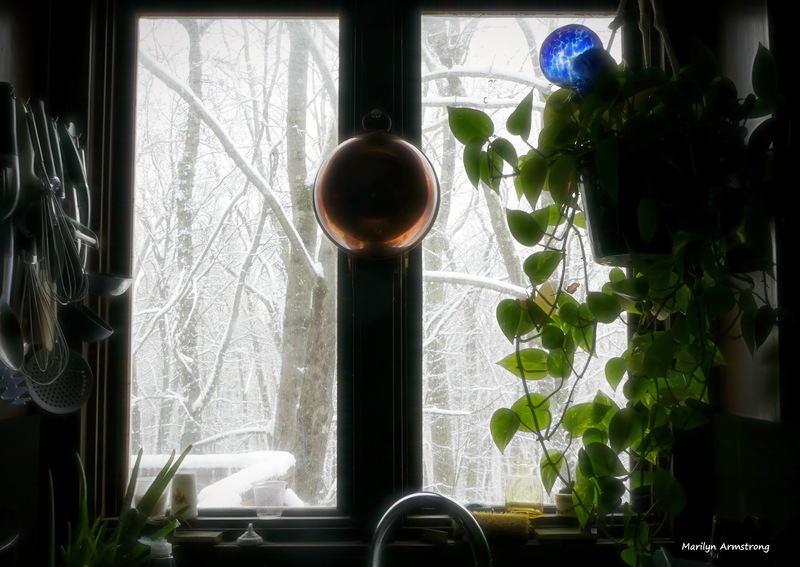 You took me back to my Grandmother’s kitchen window on Bay State Road, Melrose, MA, circa 1978. You know, the Winter we had that HUGE blizzard. Write what you want when it works for you. No need to write even a single post a day if it keeps you from enjoying the rest of your life. As for the whole burial thing, though, I had to laugh. Dealing with a chronic illness and being single, I did make arrangements as I’m a control freak who doesn’t want anyone else out of pocket because I didn’t wrap up my affairs as well as I otherwise might before I leave this crazy old world. Like you, I did (and still do) live a messy, messy, life. Disorganization helps me think ! But, I’m trying to be better as it gets closer to the end. No promises I’ll succeed in outliving the monthly payments to ensure everything is set, but my clean up crew will know I tried. Have a good day, and thanks for sharing a moment in your day.